Next month Porsche will begin offering a rechargeable lithium ion battery as a $1,700 option on the new Boxster Spyder and 911 GT3 and GT3 RS, above. 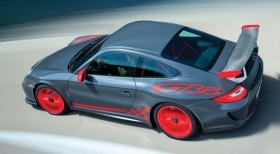 The option is 9 pounds lighter than Porsche's normal lead-acid starter battery. Next month, Porsche will begin offering a smaller, lighter weight rechargeable lithium ion battery as a factory option on the new Boxster Spyder and 911 GT3 and GT3 RS in lieu of Porsche's normal lead-acid starter battery. The option will cost a hefty $1,700. It also will be offered as a retail retrofit on those three models starting in February. But Porsche is promoting the technology as a way to save 9 pounds in vehicle weight, a step that could improve a car's agility in a small way, says Hans-Juergen Woehler, product director for Porsche's Boxster line. Porsche's lead-acid starter weighs 22 pounds. The lithium ion option weighs less than 13.